Those estimates far exceed even the direst predictions of climate scientists and set the room abuzz. The most often cited figure and the one used by the Intergovernmental Panel on Climate Change (IPCC) warns of a loss of sea ice by 2030. 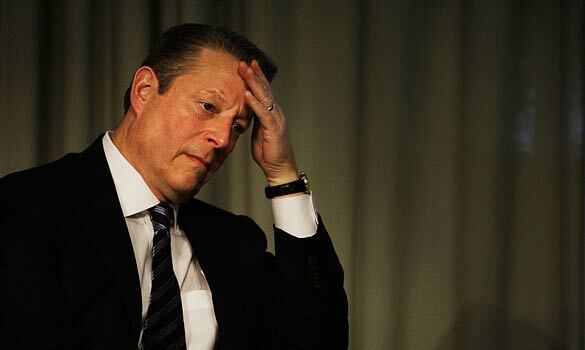 "It is hard to capture the astonishment that the experts in the science of ice felt when they saw this," Gore said. Not only were the ‘experts in the science of ice’ astonished, so too was Dr. Maslowski of the US Naval Postgraduate School, the scientist whose models supposedly came up with the five to seven year figure. From the Alaska Dispatch: 20th November 2011. New research from Cambridge University predicts that the North Pole could be ice-free in just a few years' time, all gone by the summer of 2015, according to various news reports this week. Arctic sea ice could completely melt away by the summer of 2015, destroying the natural habitat of animals like polar bears, one of Britain's leading ocean experts has claimed. A well educated friend keeps saying that this is evidence that the planet is warming. However the data from NCDC, NASA:GISS and Hadley CRUT all show that warming has stalled for around ten years. See the Hadley graph here. So why is the sea ice melting? Rapid Rebound Brings Ice Back to Levels from the 1980s. A report from the US National Snow and Ice Data Center in Colorado finds that Arctic summer sea ice has increased by 409,000 square miles, or 26 per cent, since 2007. But didn't we hear from the same Center that the North Pole was set to disappear by now? We all deserve apologies from the global warming fanatics who wanted to reshape the world in their image and called those who objected to their wild theories ignorant deniers. They were so convinced the world was ending and only they could save it, yet now they have been exposed as at best wildly idealistic and at worst frauds. Southward extension is farthest over the past 20 years. Sea ice is encroaching unusually early on the central Bering Sea, threatening to grind Alaska's economically important snow crab fishery to a halt at the peak of the season, leaving crabbers facing major losses. Earlier-than-expected ice is moving south over prime crabbing grounds, forcing boats away from their catch and putting millions of dollars of equipment in jeopardy. So who are we to believe? Is it scientists needing further research grants? Or is it the fishermen whose income whose income is threatened?